On December 9th, Mike and I loaded up the dogs in a rented RV and started the long drive to Orlando, FL so Maizey and I could compete at the AKC Agility Invitational. It takes 4 long days of driving to get there, and we stayed on-site at the venue. What a spectacle! Nearly 600 dogs in the Agility competition, and they had an Obedience Invitational, Dock Dogs, and the Eukanuba Championship (conformation show) going on simultaneously: a solid weekend celebrating dogs. Maizey ran so nicely for me in her four scored runs: JWW, Std, JWW, and Hybrid, with finishes in the top 5 in every class. We ended up 3rd overall in our 16″ division, out of 140 dogs. Maizey won a little prize money for being third in the agility trial, and the highest scoring dog with a Rally title too. 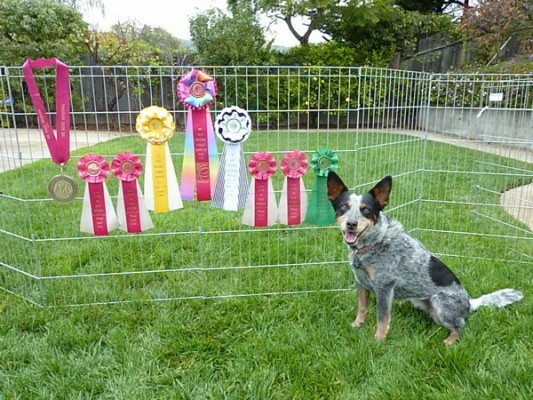 She was also awarded a big medal for being the highest scoring Australian Cattle Dog too, plus a few pretty ribbons. We earned the chance to run in the Finals class on Sunday evening, where we had a nice run but also our only error of the weekend. I was so thrilled with Miss Maizey at the Invitational, she really showed up ready to play and be a good girl for me. Maizey is only 3 years old yet seemed so mature in how she handled the days of traveling, three changes in time zones, the 5 of us living in cramped quarters for 2 weeks, and running in an unfamiliar, busy setting with dogs and people everywhere. It was such a super way to top off the year, so proud of my Maizey!